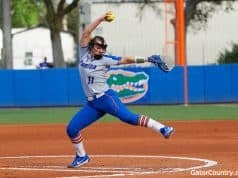 The Florida Gators won the Gainesville Regional Final rematch on Wednesday with timely hits; a patient approach and another errorless effort in a 7-4 win over Bethune Cookman. JJ Schwarz led the way with a 3-4 performance. 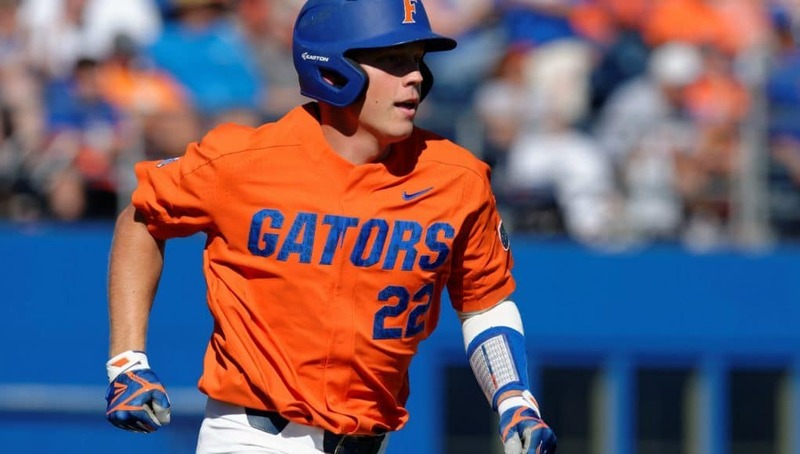 Florida’s captain hit his second home run of the season, scored three times and drove in two more runs to keep his hot start to the season rolling. Through five games Schwarz is hitting .474 and slugging .947. It’s true. After starting the season 5-8, Schwarz went 1 for his next seven-plate appearance with three strikeouts and several popups. He was trying to pull the ball, something he worked on throughout the week in the batting cages. 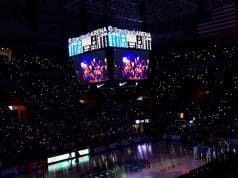 Florida got on the board early Wednesday. Nelson Maldonado (3-4) doubled with one out and scored three batters later when Wil Dalton singled to right field, his ninth RBI of the year. Florida jumped back out and extended the lead in the third inning. Maldonado led the inning off with a single and Schwarz’s home run, which landed with a thud against the scoreboard in right field, brought them both home. Will Dalton doubled to keep the inning going. He advanced to third and eventually scored on a balk, not without some theatrics. Bethune came back in a fury in the top of the fourth. Freshman Jordan Baker, who was making his first start, had held the Wildcats at bay through three but ran out of gas in the fourth. Baker allowed back-to-back singles to start the inning and both runners advanced into scoring position on a passed ball. A walk loaded the bases and a Zach Spivey singled plated two before he was replaced on the mound by sophomore Nick Long. Long surrendered one run before getting out of the jam. 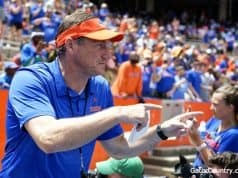 Florida added an unearned run in the fifth to boost its lead to 5-3 and two more in the seventh but the game was far from over. Freshman Connor Churchill replaced Hunter McMullen in the ninth inning — his first career appearance. Churchill struck out the first batter he faced but when the tying run reached the on deck circle after back-to-back singles he was pulled in favor of Michael Byrne. The preseason All-American had just one appearance on the year but entered Wednesday for his first save opportunity. Byrne gave up one run but earned the final two outs for his first save of the season. Florida improved to 5-0 on the season and will travel Thursday morning down to Miami for a three-game series with the Hurricanes starting Friday night at Alex Rodriguez Park at Mark Light Field.